I seldom play with the bells and whistles of Qt gui elements. All I used to do is adding some buttons on a QDialog derived object and connecting them to handlers. That is all I knew about the GUI programming in the past. But if you like the whistling GUI elements and you want a beautiful application window, you may need to learn something about those GUI classes. 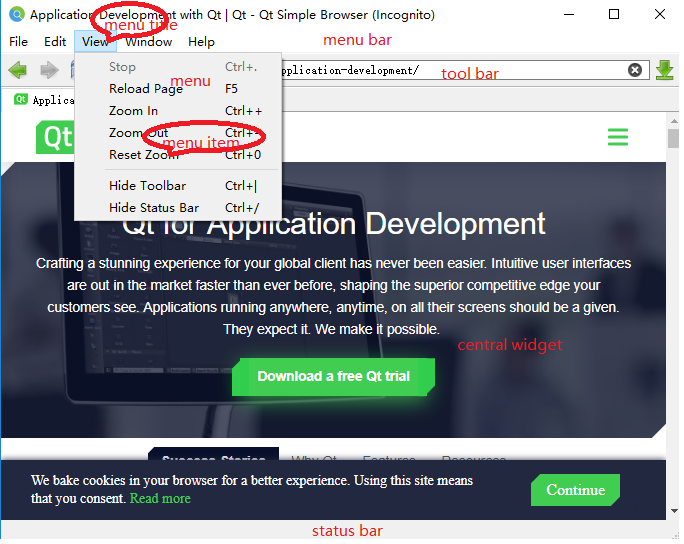 You’d better learn GUI programming from a QMainWindow demo as QMainWindow integrates some important GUI components such as menu bar and status bar. will set the key sequence QKeySequence::AddTab(const 19) as the shortcut key for the action. But what on earth is the key sequence QKeySequence::AddTab? Well, it depends on the system. On my system, QKeySequence::AddTab stands for Ctrl+T. You can see the key sequence right next to the menu item. Pressing Ctrl T has the same effect as clicking the menu item. But what’s the meaning of the underline in a menu item? It is another kind of shortcut key, which can be specified by adding a & before the key character in the menu item string. When the pull-down menu is displayed, you can press the key with a underline in some menu item, which has the same effect as clicking that menu item. So every menu item that belongs to the same menu must have unique short key. This kind of short keys only work when the pull down menu is displayed，while the first kind of short keys work do not have this requirement. The other version of addAction takes the menu item string, the handler, the shortcut key as its parameter, which completes the work of constructing an action object. A menu can has seperators between menu items that serve to group menu items. How to create a tool bar? How to create a status bar? The position of central widget is determined beforehand: below the tool bar and above the status bar.